Tania Lambert ACS is an award winning cinematographer with a keen eye for composition and lighting and a desire to tell stories, which move people in every way. She began her career in the film industry in 2003 as a camera assistant working in commercials & music videos as well as documentaries overseas. 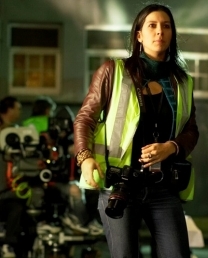 She returned to Australia in 2007 to commence a Masters degree in Cinematography at AFTRS. In 2008, she graduated and received the High Achievement Award for Cinematography at AFTRS for Cupid, as well as the ACS Gold Award in ‘Student’ Short Film. Spirit in ‘Specialised & Experimental’ , a Silver Award in ‘Music Video’ with her work on Vulnerable Heart and a Bronze in ‘Student’ short film for Jigsaw Girl. Tania is currently working as a freelance cinematographer both in Australia and overseas and has extensive experience in short form drama, TVCs, music videos, documentary & narrative photography.